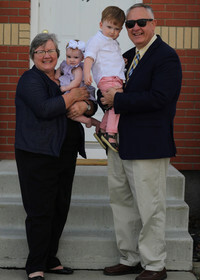 Ray Burks became pastor of Belmont First Baptist Church in August of 2009. Prior to that he was senior pastor at Lakeview Baptist Church in Selmer, TN for 10 years. He served as pastor of three other churches in Mississippi since 1986. Ray served for six years as a minister to students while completing his college and seminary education. Ray married Amy in 1984 only 20 days after both graduated from college. They have adult two sons, Matt and Taylor. Matt is a graduate of Union University in Jackson, TN (BBA), University of Southern Mississippi (MBA) and Canadian Southern Baptist Seminary (MDiv). He is married to Alisha, who is a graduate of William Carey University and New Orleans Baptist Theological Seminary. They currently live in New Orleans, LA a where Matt is a Ph. D. student at the New Orleans Baptist Seminary. They are the parents of the greatest grand children, Judah and Elizabeth. Taylor is a graduate of Belmont High School and Northeast Mississippi Community College in Booneville, MS. and Delta State University in Cleveland, MS majoring in Music. Taylor writes band music and marching arrangements for local schools. He has also participated in Drum Corp International competitions. Following college and marriage, Ray attended Southwestern Baptist Theological Seminary in Fort Worth, TX. He left Southwestern to pastor the Enon Baptist Church in Grenada, MS and ultimately completed his Master's degree at Liberty Baptist Theological Seminary and earned his Doctorate of Ministry in Biblical Preaching through the Master's International Seminary, studying expository preaching under the late Dr. Stephen F. Olford. In his spare time, Ray has served as an adjunct instructor for Union University, University of Tennessee at Martin and Itawamba Community College. Amy has served as a Science teacher since 1984. In 1990 she received her Master of Science in Natural Science degree from Delta State University. Following that, she completed advanced work toward her Education Specialist degree from Mississippi State University. In 2004 she completed her National Board Certification as a secondary science teacher. In 2005 she received the prestigious Presidential Award for Excellence in Mathematics and Science Teaching from the National Science Foundation in Washington, D.C.. She is currently an instructor in Natural Sciences at Northeast Mississippi Community College in Booneville, MS.
Ray counts it a great privilege to serve as pastor of a church like FBC Belmont. Since surrendering to the call to preach at age 16, it has been his desire to follow God's will as a preacher of the Gospel of Jesus Christ.